In the previous article on Hidden Markov Models it was shown how their application to index returns data could be used as a mechanism for discovering latent "market regimes". 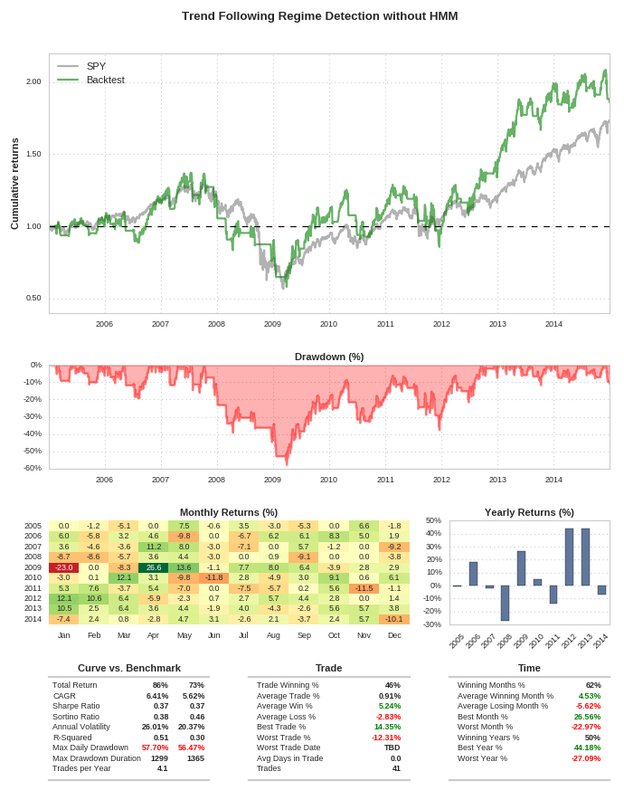 The returns of the S&P500 were analysed using the R statistical programming environment. It was seen that periods of differing volatility were detected, using both two-state and three-state models. In this article the Hidden Markov Model will be utilised within the QSTrader framework as a risk-managing market regime filter. It will disallow trades when higher volatility regimes are predicted. The hope is that by doing so it will eliminate unprofitable trades and possibly remove volatility from the strategy, thus increasing its Sharpe ratio. In order to achieve this some small code modifications to QSTrader were necessary, which have now been made live on the Github page. The market regime overlay will be paired with a simplistic short-term trend-following strategy, based on simple moving average crossover rules. The strategy itself is relatively unimportant for the purposes of this article, as the majority of the discussion will focus on implementing the risk management logic. QSTrader is written in Python, while the previous implementation of the Hidden Markov Model was carried out in R. Hence for the purposes of this article it is necessary to utilise a Python library that already implements a Hidden Markov Model. hmmlearn is such a library and it will be used here. The first discusses the mathematical and statistical basis behind the model while the second article uses the depmixS4 R package to fit a HMM to S&P500 returns. Hidden Markov Models are a type of stochastic state-space model. They assume the existence of "hidden" or "latent" states that are not directly observable. These hidden states have an influence on values which are observable, known as the observations. One of the goals of the model is to ascertain the current state from the set of known observations. In quantitative trading this problem translates into having "hidden" or "latent" market regimes, such as changing regulatory environments, or periods of excess volatility. The observations in this case are the returns from a particular set of financial market data. The returns are indirectly influenced by the hidden market regimes. Fitting a Hidden Markov Model to the returns data allows prediction of new regime states, which can be used a risk management trading filter mechanism. The trading strategy for this article is exceedingly simple and is used because it can be well understood. The important issue is the risk management aspect, which will be given significantly more attention. This is not a particularly effective strategy with these parameters, especially on S&P500 index prices. It will not really achieve much in comparison to a buy-and-hold of the SPY ETF for the same period. However, when combined with a risk management trading filter it becomes more effective due to the potential of eliminating trades occuring in highly volatile periods, where such trend-following strategies can lose money. 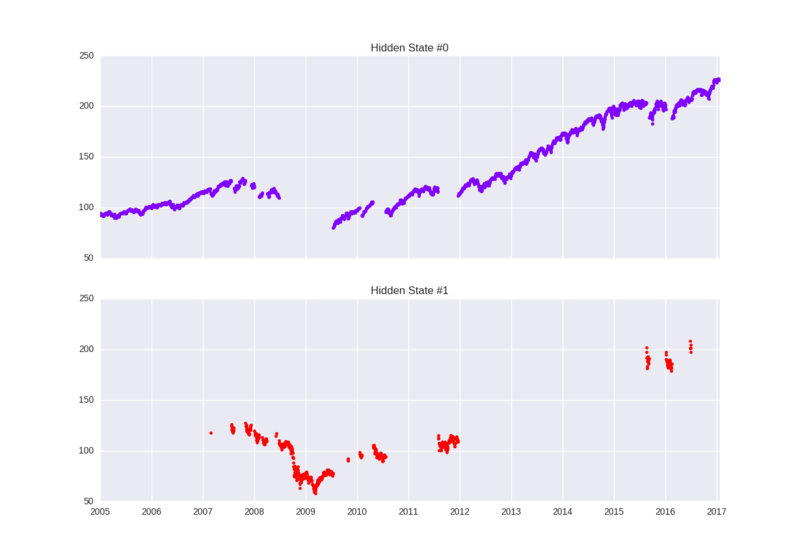 The risk management filter applied here works by training a Hidden Markov Model on S&P500 data from the 29th January 1993 (the earliest available data for SPY on Yahoo Finance) through to the 31st December 2004. This model is then serialised (via Python pickle) and utilised with a QSTrader RiskManager subclass. The risk manager checks, for every trade sent, whether the current state is a low volatility or high volatility regime. If volatility is low any long trades are let through and carried out. If volatility is high any open trades are closed out upon receipt of the closing signal, while any new potential long trades are cancelled before being allowed to pass through. This has the potential desired effect of eliminating trend-following trades in periods of high vol where they are likely to lose money due to incorrect identification of "trend". The backtest of this strategy is carried out from 1st January 2005 to 31st December 2014, without retraining the Hidden Markov Model along the way. In particular this means the HMM is being used out-of-sample and not on in-sample training data. This data will need to placed in the directory specified by the QSTrader settings file if you wish to replicate the results. In order to carry out regime predictions using the Hidden Markov Model it is necessary to calculate and store the adjusted closing price returns of SPY. To date only the prices have been stored. The natural location to store the returns is in the PriceHandler subclass. However, QSTrader did not previously support this behaviour and so it has now been added as a feature. It was a relatively simple modification involving two minor changes. The first was to add a calc_adj_returns boolean flag to the initialisation of the class. If this is set to True then the adjusted returns would be calculated and stored, otherwise they would not be. In order to minimise impact on other client code the default is set to False. The second change overrides the "virtual" method _store_event found in the AbstractBarPriceHandler class with the following in the YahooDailyCsvBarPriceHandler subclass. This modification is already in the latest version of QSTrader, which (as always) can be found at the Github page. Attention will now turn towards the implementation of the regime filter and short-term trend-following strategy that will be used to carry out the backtest. There are four separate files required for this strategy to be carried out. The full listings of each are provided at the end of the article. This will allow straightforward replication of the results for those wishing to implement a similar method. The first file encompasses the fitting of a Gaussian Hidden Markov Model to a large period of the S&P500 returns. The second file contains the logic for carrying out the short-term trend-following. The third file provides the regime filtering of trades through a risk manager object. The final file ties all of these modules together into a backtest. Prior to the creation of a regime detection filter it is necessary to fit the Hidden Markov Model to a set of returns data. For this the Python hmmlearn library will be used. The API is exceedingly simple, which makes it straightforward to fit and store the model for later use. The following function, plot_in_sample_hidden_states, is not strictly necessary for training purposes. It has been modified from the hmmlearn tutorial file found in the documentation. to understand the market regimes. It can be seen that the regime detection largely captures "trending" periods and highly volatile periods. In particular the majority of 2008 occurs in Hidden State #1. This script is tied together in the __main__ function. Firstly all warnings are ignored. Strictly speaking this is not best practice, but in this instance there are many deprecation warnings generated by Scikit-Learn that obscure the desired output of the script. Subsequently the CSV file is opened and the rets variable is created using the np.column_stack command. This is because hmmlearn requires a matrix of series objects, despite the fact that this is a univariate model (it only acts upon the returns themselves). Using NumPy in this manner puts it into the correct format. The GaussianHMM object requires specification of the number of states through the n_components parameter. Two states are used in this article, but three could also be tested easily. A full covariance matrix is used, rather than a diagonal version. The number of iterations used in the Expectation-Maximisation algorithm is given by the n_iter parameter. The next stage in the process is to create the Strategy class that encapsulates the short-term trend-following logic that will ultimately be filtered by the RiskManager module. All QSTrader AbstractStrategy-derived subclasses use a calculate_signals method to generate SignalEvent objects. The method here firstly checks whether the event is an OHLCV bar. For instance, it could be a SentimentEvent (as in other strategies) and thus a check is required. The prices are appended to the deques in the correct manner, thus providing rolling windows over which to perform the SMA. The subclassed AbstractRiskManager object is the first major usage of risk management applied separately to a strategy on the site to date. As outlined above the goal of this object is to filter the short-term trend-following trades when in an undesirable high volatility regime. out in regime 0, but closing trades are allowed in regime 1. # Create the order event, irrespective of the regime. The latter half of the method is where the regime detection risk management logic is based. It consists of a conditional block that firstly checks which regime state has been identified. If it is the low volatility state #0 it checks to see if the order is a "BOT" or "SLD" action. If it is a "BOT" (long) order then it simply returns the OrderEvent and keeps track of the fact that it now has a long position open. If it is "SLD" (close) action then it closes the position if one is open, otherwise it cancels the order. If however the regime is predicted to be the high volatility state #1 then it also checks which action has occurred. It does not allow any long positions in this state. It only allows a close position to occur if a long position has previously been opened, otherwise it cancels it. This has the effect of never generating a new long position when in regime #1. However, a previously open long position can be closed in regime #1. An alternative approach might be to immediately close any open long position upon entering regime #1, although this is left as an exercise for the reader! This concludes the RegimeHMMRiskManager code. All that remains is to tie the above three scripts/modules together through a Backtest object. The full code for this script can be found, as with the rest of the modules, at the end of this article. In the run function the first task is to specify the HMM model pickle path, necessary for deserialisation of the model. Subsequently the price handler is specified. Crucially the calc_adj_returns flag is set to true, which sets the price handler up to calculate and store the returns array. At this stage the MovingAverageCrossStrategy is instantiated with a short window of 10 days, a long window of 30 days and a base quantity of SPY shares of 10,000. Finally the hmm_model is deserialised through pickle and the risk_manager is instantiated. The rest of the script is extremely similar to other backtests carried out on the site, so the full code will only be outlined at the end of the article. The strategy results presented here are given net of transaction costs. The costs are simulated using Interactive Brokers US equities fixed pricing for shares in North America. They are reasonably representative of what could be achieved in a real trading strategy. The underlying strategy is designed to capture short-term trends in the SPY ETF. It posts a Sharpe Ratio of 0.37, which means it is taking on a substantial amount of volatility in order to generate the returns. In fact the benchmark has an almost identical Sharpe ratio. The maximum daily drawdown is slightly larger than the benchmark, but it produces a slight increase in CAGR at 6.41% compared to 5.62%. In essence the strategy performs about as well as the buy-and-hold benchmark. This is to be expected given how it behaves. It is a lagged filter and, despite making 41 trades, does not necessarily avoid the large downward moves. The major question is whether a regime filter will improve the strategy or not. Note that this application of the regime filter is out-of-sample. That is, no returns data used within the backtest was used in the training of the Hidden Markov Model. The regime filter strategy produces rather different results. Most notably it reduces the strategy maximum daily drawdown to approximately 24% compared to that produced by the benchmark of approximately 56%. This is a big reduction in "risk". However the Sharpe ratio doesn't increase too heavily at 0.48 because the strategy still endures a lot of associated volatility to obtain those returns. The CAGR does not see a vast improvement at 6.88% compared to 6.41% of the previous strategy but its risk has been reduced somewhat. Perhaps a more subtle issue is that the number of trades has been reduced from 41 to 31. While the trades eliminated were large downward moves (and thus beneficial) it does mean that the strategy is making less "positively expected bets" and so has less statistical validity. 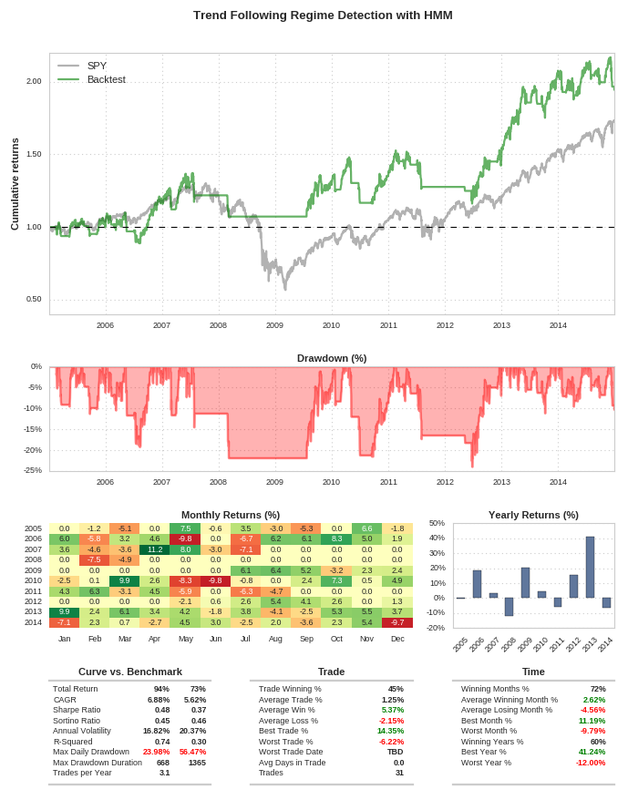 In addition the strategy did not trade at all from early 2008 to mid 2009. Thus the strategy effectively remained in drawdown from the previous high watermark through this period. The major benefit, of course, is that it did not lose money when many others would have! A production implementation of such a strategy would likely periodically retrain the Hidden Markov Model as the estimated state transition probabilities are very unlikely to be stationary. In essence, the HMM can only predict state transitions based on previous returns distributions it has seen. If the distribution changes (i.e. due to some new regulatory environment) then the model will need to be retrained to capture its behaviour. The rate at which this needs to be carried out is, of course, the subject of potential future research!